This personalized print casts your favorite child as an amazing storybook character. Cast your favorite little person as an amazing literary figure--whether a newborn making a debut or a young child in the first few pages of his or her thrilling tale--with this delightfully personalized print, featuring a custom, storybook-inspired illustration and your custom rave "review." For newborns, it's an imaginative antidote to ordinary birth announcements; for young children, it commemorates the magical story of early childhood. For more storybook titles, check out our Personalized Storybook Art - Adventure, Personalized Storybook Art - Brave, and Personalized Storybook Art - Legend. 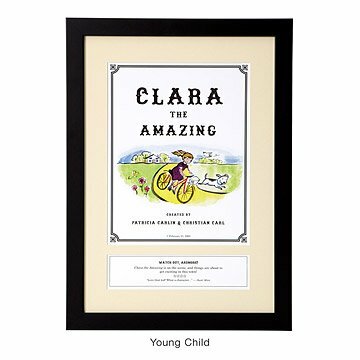 Inspired by classic children's literature illustrations, our Personalized Storybook Art - Amazing, illustrated by Patricia Carlin, offers creative portrayals of children as adventurous, timeless characters. Playful details like relatives' "review" of the child's debut and their birthday as "copyright" make this keepsake a truly individualized expression of a child's character, and a distinctive birth announcement or toddler tribute to be treasured for years to come. The Personalized Storybook Art - Amazing is packaged in a partially recycled and fully recyclable/compostable box. There's one place—and only one place—where you'll find the Personalized Storybook Art - Amazing: UncommonGoods. Customizing & proof process was easy (did have 1 glitch, but it was fixed)and delivery was prompt and on time. This is a gift for our new grandchild and would make a nice gift for a birthday or holiday. Great art display anywhere in the home, but intended for the child's playroom/bedroom or the family room. WONDERFULLY AND EXCITINGLY RECEIVED BY BOTH CLARA AND HER PARENTS. ORDERED ANOTHER ONE FOR HER COUSIN! I purchased this as a gift for my niece and her husband who had adopted a baby, their first child. I wanted a gift that was as unique and special as the event and this was perfect. It took a while for me to confirm all of the pertinent information and the artist was patient with my corrections and questions, reworking the art until it was just as I wanted. It shipped earlier than expected and has been a hit with the recipients and everyone who has seen it. I highly recommend! This gift was a major hit! This was a perfect gift to hang in my grandson's room. His had a very difficult birth and has been a true superhero through it all. This celebrates his successes and my daughter loves it. The product was even better than I expected.